The Flame Volleyball Award is available with several different inserts. It is a small inexpensive volleyball trophy with great character. All custom built volleyball trophies come with a laser engraved brushed gold plate. We offer a large selection of volleyball awards. The Flame Volleyball Trophy is available with several different inserts. This volleyball award has a Column for additional height. This is an inexpensive trophy with great character to fit you're your budget. All custom built volleyball trophies come with a laser engraved brushed gold plate. We offer a large selection of volleyball awards. The Flaming Volleyball Trophy is an inexpensive volleyball award that children have enjoyed for many years. These volleyball trophies are a great choice for any budget. Volleyball awards come with a laser engraved brushed gold plate. The Laurel Classic Volleyball Trophy is available with several different inserts. 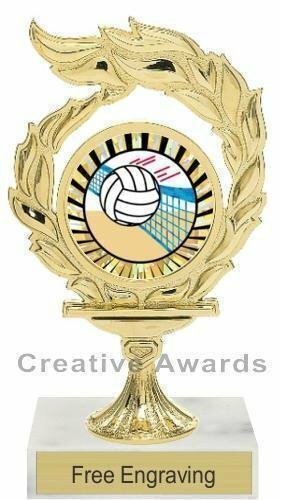 This beautiful volleyball award is a great value. All custom built volleyball trophies come with a laser engraved brushed gold plate. You will find a wide selection of volleyball awards. The Laurel Tower Volleyball Trophy is available with several different inserts. This impressive volleyball award is a great value. All custom built volleyball trophies come with a laser engraved brushed gold plate. You will find a wide selection of volleyball awards. The Laurel Volleyball Trophy is available with several different inserts. This beautiful volleyball award is a great value. All custom built volleyball trophies come with a laser engraved brushed gold plate. You will find a wide selection of volleyball awards. The Mega Star Volleyball Award is a great choice for your star players. This volleyball trophy is economically priced to fit any budget. All custom built volleyball trophies come with a laser engraved brushed gold plate. You will find a wide selection of volleyball awards. The Mega Star Volleyball Trophy is a great choice for your star players. This volleyball award has a rectangular Column for added height and impressiveness. The volleyball awards economically priced to fit any budget. All custom built volleyball trophies come with a laser engraved brushed gold plate. You will find a wide selection of volleyball awards. The Shooting Star Volleyball Award is an inexpensive volleyball trophy that children have enjoyed for many years. These volleyball trophies are a great choice for any budget. Volleyball awards come with a laser engraved brushed gold plate. This Tower Volleyball Trophy is an inexpensive volleyball award that is even more sturdy than the classic volleyball trophies. These volleyball awards are a great choice. Each volleyball award comes with a laser engraved brushed gold plate.